I just added a new buddy to Hazel's pot, an onion start to keep bugs away. Isn't that little rose just peachy? Such a welcome sight after watching a heavy blanket of snow covering my mid-Missouri garden earlier. It was sunny and 81F two days ago, now back to winter, yet another reason why I surround myself with indoor greenery, I have at least one place where I can rely on seeing green every day through winter. This is Hazel on December 29, 2017 right after I brought her home from a local grocery store sale. Friends tell me they have little luck growing roses but I find them to be easy to grow, especially miniature roses. The miniature varieties are actually shrub roses, which means they are hardier stock, bloom longer and can more easily adapt to a variety of soils. 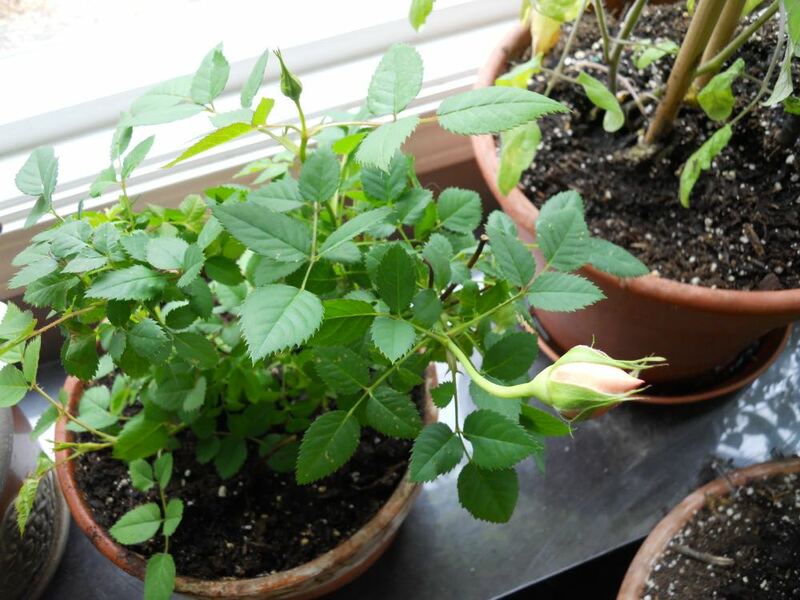 I don't recommend growing miniature roses inside unless you have room for large soil containers because they need to pull a lot of soil nutrients but you can certainly pick up a few on sale now and grow them inside until the danger of frost is over in May, then condition them to grow permanently outside. 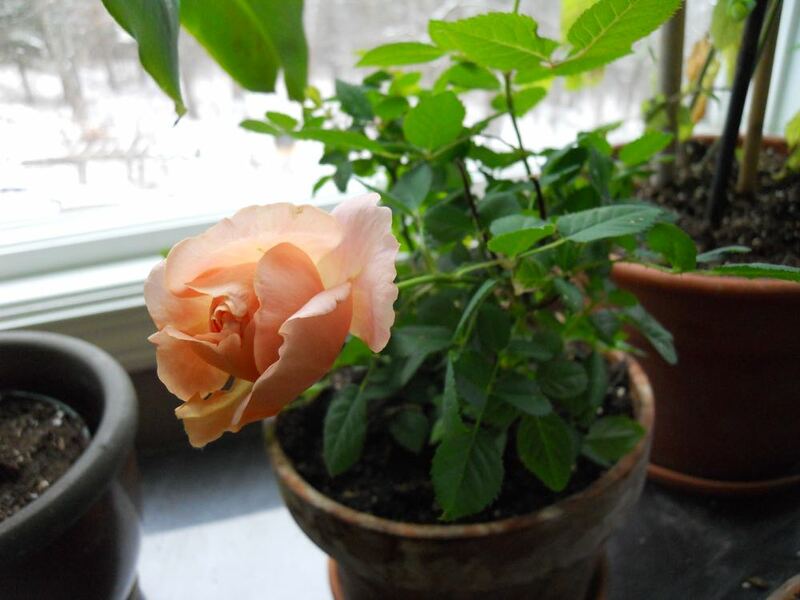 Once I had Hazel watered, I found a pot larger than the one she was in, added some broken flower pot shards in the bottom, new potting soil and my concoction of dried coffee grounds, banana peels, epsom salts and crushed eggs shells, then more potting soil and the roses. More potting soil, tapped gently, then sprayed water with a spray bottle until wet so I don't over water. Back to the window to be turned towards the sun and checked daily. The plant is in a window facing southwest next to Miriam, the cherry tomato also growing and producing delicious cherry tomatoes midwinter inside. I watch the color of the leaves to make sure they don't start turning light green, that means the plant needs more nitrogen. Getting new potting soil with added composting materials should prevent that from happening but I still monitor, just in case. Success is seeing the first signs of flower buds and here they were, a little less than 2 months after I brought the plant home. This was the first bud that became the rose you saw on top, and there is a second one forming. So growing roses is not hard, or expensive, you just have to pick the right variety and time when you buy them.